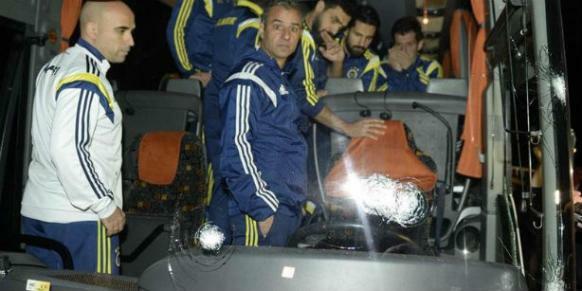 Fenerbahce’s team bus has been attacked by a gunman after their 5-1 victory at Rizespor. The driver was taken to hospital but no players were injured in the attack, which happened while they were travelling to Trabzon airport. PM Ahmet Davutoglu said an investigation was under way. The Turkish Football Federation condemned the attack and Fenerbahce general secretary Mahmut Uslu said the incident was “very wrong”. “We come here to do sport; we come to play football,” said Mahmut Uslu, who was on the bus at the time of the attack. Abdulcelil Oz, the governor of Trabzon in the north-east of Turkey, initially said the bus appeared to have been hit by a stone but later released a second statement, saying it seemed to have been a bullet. “The latest situation is that it appears to be a gun,” Abdulcelil Oz said. Large crowds of Fenerbahce fans waited at Istanbul Airport to welcome the players back. President Recep Tayyip Erdogan, a Fenerbahce supporter, reportedly called the local governor to inquire about the investigation into the incident. Fenerbahce are the defending champions and have won the major domestic competition 19 times, with former Premier League players Dirk Kuyt, Raul Meireles and Emre in their side. Istanbul-based Fenerbahce went top of the table with their victory on April 4, one point ahead of bitter rivals Galatasaray.